A lush green campground, tents pitched high in the colours of the rainbow and a fully lit BBQ dinner round a bonfire – this and more is waiting for you at the Karnala campground organised by travel company Big Red Tent. 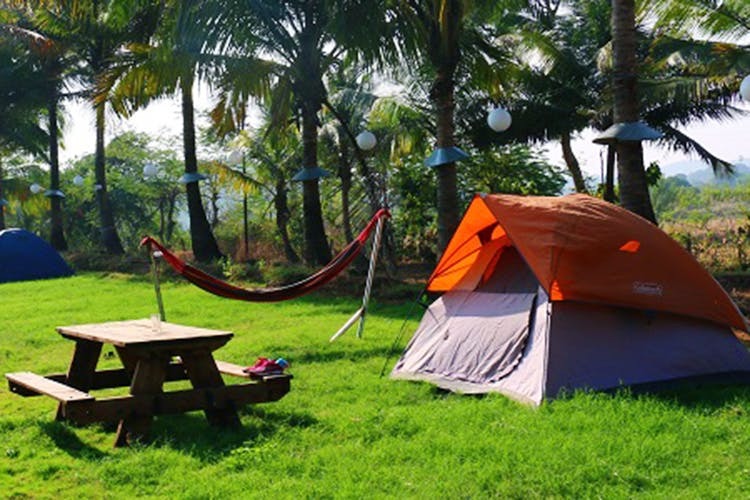 The Karnala campground is only about 1.5-2 hours from Mumbai. Grab a few friends and make a road trip of it – turn on google maps for best possible, although sometimes absurd directions or else just drive along the Mumbai-Pune expressway. It’s also just a train ride away to Panvel. From the Panvel station, the organisers can arrange transport for you at an additional cost. The monsoon clouds are setting closer, and while there’s much we’re already mentally dreading, we’re happy to think about all the lush campsites that we can pitch our tents on. The Karnala campsite is very beautiful, especially in the rainy season as a 5-minute trek will lead you to a private natural waterfall. The checkin time is about 4pm post which there are activities in which you can participate in such as tent-pitching, BBQ grilling, a night trail through the forest nearby and even a visit to the fisherman’s village nearby the following morning. The food served is barbecued mushrooms, jacket potatoes, veggies, chicken and more. There is also dal roti for options. Some of the obvious necessities such as trekking shoes, mosquito repellant, towels, meds and extra clothes. And non-obvious ones like marshmallows to roast, books to flip, musical instruments to strum to pass the while away. The Karnala Bird Sanctuary is a 5-minute drive from where the group will be, and through it you can also reach the famous Karnal Fort. Their Facebook page has details about other camps as well here.